I thought Base was tasked to blog when it was Roy Halladay Day? So my apologies for the last minute post, the game is at 1Pm. Las Vegas must be reading Bigrips.wordpress.com (soon to be just bigrips.com) because they keep upping the Doctor’s odds each start. Today the Phils (-230) host the St. Louis Cardinals. Doc goes for win number 6 against Kyle Lohse who is 0-1 in 5 starts this year. I am loving the Run Line here and after a successful Happy Roy Halladay & Javier Vazquez (Blows) day I am gonna ride the Doctor again. What a polarizing day it is. 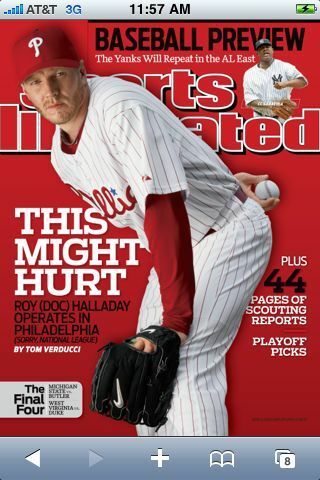 First it’s Happy Roy Halladay Day, and I was giddy with excitement when I saw the Phillies -200 vs the Mets. The Mets are hot they’ve won 8 in a row – but I still take Doc any day of the week and need to make up for his lose in his last start. I scrolled down some more and cringed when I saw Javier Vazquez -158 was pitching against his old squad the White Sox, I wrote earlier this year about how much Javey blows. I cringed because I know the Yankees will lose today, but at the same time was happy because I’ll easily win a 2 team parlay with the Phillies and the Chi Sox. 4 up 4 down Roy Halladay has been everything we predicted this year. His ERA is 0.85 and has walked only 3 guys in 33.0 innings pitched, and has let up just 3 earned runs during this stretch, sick. It’s like playing the computer on rookie mode in MLB 2K10 How are we not all riding Doc? Well I am hoping on the machine tonight as the Phillies (-150) travel to San Francisco to take on the Giants at 10:15pm. I love waking up at 3am to take a piss and then check my phone to see that the late game hit, it’s like getting paid to sleep. so I will take the Phils and free money tonight while I sleep. Well we spend hours and hours researching, collaborating, looking at trends and crunching the numbers to help us determine what guaranteed free winners we take. Below is a very typical conversation between Building Up that Base and I which highlights the amount of time and dedication that we put into the selection process. P.S. the subject line is Nike 5.0 becasue I started the email off talking about my new sick shoes Nike 5.0’s these things are great. They are like wearing air on your feet so light weight. -235 vs Oswalt. Now that’s more like it. Oswalts a good pitcher, but Roy has the bats to back him up. Win number 2 of the season for some free money. I am eying Santana too, but need to look into further. Every time I dig into the Mets it seems they have there 3 best players on the DL.